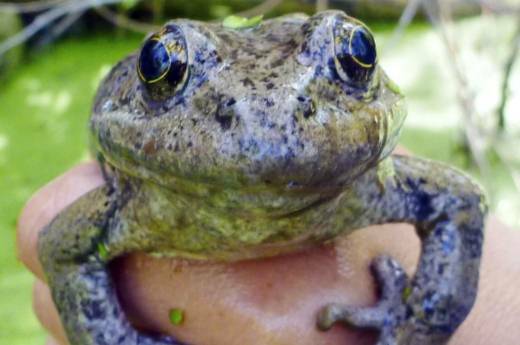 Scientists working in the Santa Monica mountains of California recently announced that endangered red-legged frogs are successfully breeding on their own in four streams there, for the first time since the 1970s. It’s a huge success for a reintroduction program that began four years ago – and an important story about water quality. The California red-legged frog (Rana draytonii) was popularized by Mark Twain in his 1865 story, “The Celebrated Jumping Frog of Calaveras County.” The amphibians were listed as threatened under the Endangered Species Act in 1996 after decades of decline caused by invasive species and water pollution. Because frogs have permeable skin, they are very sensitive to water quality. And because so much of their habitat has been developed, it would seem unlikely that reintroduction could succeed in a place like the Santa Monica Mountains National Recreation Area, the largest urban national park in the United States. But enough viable streams were found to make reintroduction worth a try, and the first frogs were translocated from the nearby Simi Hills in 2014. And in March of this year, scientists found the first egg masses laid by red-legged frogs that had successfully mated in their new homes. Water Deeply recently spoke with Katy Delaney, a wildlife ecologist with the National Park Service. Other partners include California State Parks, the Mountains Recreation and Conservation Authority, the U.S. Fish and Wildlife Service, the Santa Monica Bay Restoration Commission and the U.S. Geological Survey. Water Deeply: How important was water quality to this reintroduction effort? There are people that kind of know this area, and they’re frog biologists, and they’re like, “How the hell did you find places to put them?” Well, we still have some nice streams. It’s partly because our park and the state parks and the local land conservancy agencies, back in the ’60s and ’70s and ’80s, were getting concerned about all of the building here and they saved big swathes of open space that were mostly ranches. And since then, a lot of it has gone back to just sort of native vegetation. All of that is really important. The native vegetation – and good, clean, normal upland vegetation – is really, really important for water quality and for water temperature because it provides some shade. Water Deeply: How were the reintroduction sites selected? Delaney: We’ve been doing regular stream surveys looking for breeding amphibians and invasive species since 2000. Our group started talking about reintroduction in earnest in 2011. We also met with other local stream experts. We picked about 35 different places to monitor to see if they are suitable habitat. We did those surveys for about three years – fall surveys when water levels are low, and spring surveys when they are high. We narrowed it down to about 10 candidate streams, then to seven. At that point, we did one round of water chemistry and water quality measurements and pesticide level monitoring. Also, I kind of consider our invasive species to be part of water quality as well. That was definitely a huge factor in where we would want to reintroduce red-legged frogs. Those places all tested very well. They were clean and they didn’t have high levels of pesticides at all. We introduced at two of them starting in 2014, then we added two more sites in 2016. So right now, we’re continuing to do all the translocation and reintroduction work at four of the seven streams. Water Deeply: What are the water quality issues you encountered? Delaney: One thing that’s really, really important: There’s a big difference in streams that have a lot of urban water inputs, versus other streams that don’t. We don’t really calculate the amount of water that’s coming from urban sources, but we do calculate the amount of urbanization in the upstream watershed. That correlates directly to the quality of water and habitat. If you have a lot of urbanization – whole cities could be upstream of your park – then the water in your park is going to be affected. Basically, it’s the things that run off urban areas. Oils, things from the road, are particularly bad. There are also lots of pesticides and there is a lot of fertilizer. High nitrogen content from fertilizers can make the algae growth go kind of crazy. There’s a lot of that from fertilizers from people’s lawns. The other big problem with urban water is we’ve channelized the streams. People don’t like it when a stream rises and goes into their house. So when you build a neighborhood around a stream, you either underground the stream or you channelize it. Then what happens during these big rain events – which we do have – you get the water not being able to meander. So the storm events can potentially be a lot more damaging. There’s a lot more energy flowing through those channelized stream corridors. What people have also done is introduce fish because they like to go fishing. And they’ve introduced crayfish, because they use crayfish as bait. That probably happened 100 years ago. And we have found new introductions of these species in the more recent time. The non-native fish and the crayfish are the things that will just eat frogs and newts at all life stages. They are really bad predators of those things. And you can never get rid of them. It’s very hard to fish out every crayfish. Water Deeply: So, were the odds against the frogs you reintroduced? Delaney: Yes, every step of the way. But I had high hopes. And I have to say, we really don’t consider this over, or a success. The frogs still have a long way to go, and it’s still sort of tenuous. I mean, they just started breeding on their own, and we don’t really know what’s going to happen. We will definitely continue to monitor for years and years to come. But these are big milestones where they did breed on their own. In the beginning when we put egg masses in stream, and then they hatched, it was amazing. That was a huge milestone. Then it was like, “OK, we got these tadpoles and they’re actually eating the food we’re feeding them and they’re not dying en masse.” Then they got big enough that we could release them. And then they became froglets. Now we have frogs literally released as tadpoles in 2014, and they’ve survived a couple of years to be of breeding age. And now that they’re breeding it’s amazing to me. The fact they actually found each other and realized this is what they’re supposed to be doing – breeding. That’s about the most exciting thing that can happen to you at work.